"Paleo style. You can put this on anything from chicken to steak to eggs. Feel free to substitute as needed if you need less kick." Mix beef stock, tomato paste, shallot, Dijon mustard, garlic, apple cider vinegar, avocado oil, cumin, cayenne pepper, black pepper, horseradish, red pepper flakes, and salt in a saucepan over medium heat. Bring to a simmer, stirring until mixture is well combined. Reduce heat to medium-low, cover, and simmer until slightly thickened, 15 to 20 minutes, stirring frequently. If you aren't rushed and have at least another 25 to 35 minutes, add an extra 1/2 cup of beef stock to the mixture at the beginning, then simmer 25 to 35 minutes or until the desired consistency is achieved. Very good sauce but doesn't taste like BBQ. You may need to add honey or something sweet to get the BBQ effect. Either way, its a very good sauce. Made it. Added liquid smoke and increased vinegar. Deleted crushed red pepper. Everyone raved at picnic. This was delicious! Perfectly spicy, I didn't find it to be too spicy at all. 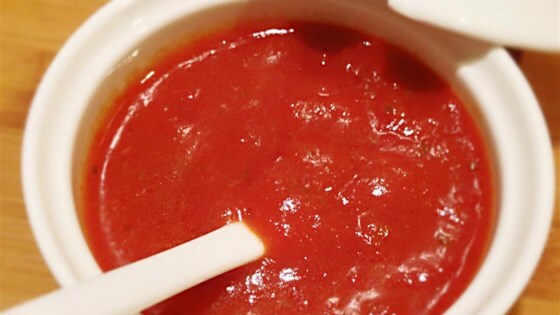 It reminds me of a spicy ketchup or a chili sauce. Loved it! It made my Whole30 dinner that much better! Very spicy! I added honey and pineapple juice until it was sweeter. Still very good, although next time I'll lighten up on the spices!